I’ve finally landed back at On Landscape head office in the depths of the East Riding of Yorkshire and things are slowly getting back to what passes for normal around these parts. I’m now at the stage of looking at the photographs taken over these last few weeks and starting to think about whether I’ve produced anything of worth - there’s that see sawing of thinking I’ve got loads of great pictures and then getting bored of them in short order. Hopefully in a few more weeks I’ll have been able to reassess them without the familiarity of the locations still in my head. There is no time to rest though as I’m straight off to London to talk with Charlie Waite about his “Year of the Print” which runs for the next week until Saturday at the Mall galleries (a report on this in the next issue). 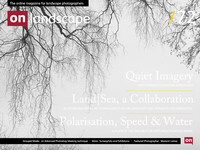 This month we’re also very proud to announce a collaboration with Triplekite publishing to produce a publication (Land|Sea) covering some of our most inspirational photographers. The book has been in the planning for a few months but it has finally come out from under wraps and we’ve had a chat with Dav Thomas about it in this issue. Triplekite have confirmed they'll be appearing at the On Landscape Conference in November at the Rheged too so start saving your pennies! The conference is selling quickly now and the more attendees, the more we'll be able to offer (news about that in future issues). 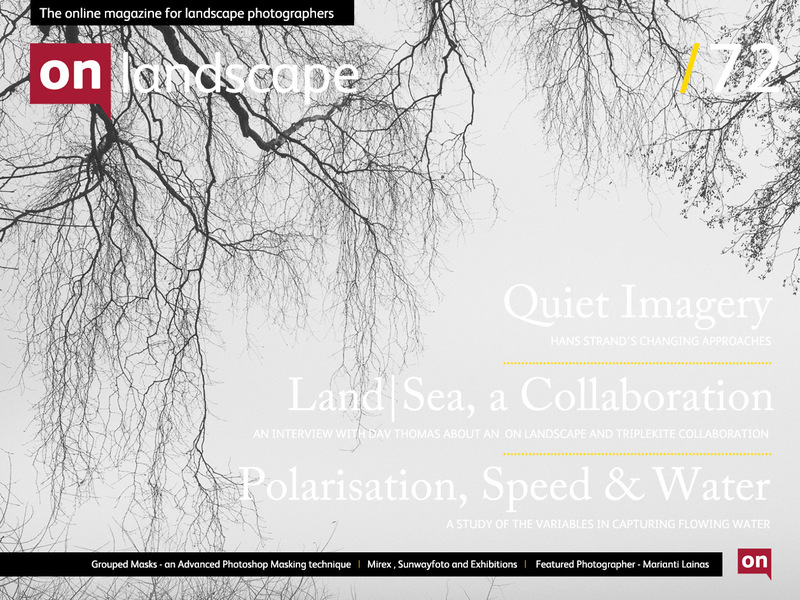 Our main article this month is “Quiet Imagery” by Hans Strand. The article talks about his changing approach to photography over the years and the way his personal experiences have moderated his work. Since I’ve returned and started post processing images from Iceland and Scotland I’ve started using a few new techniques I’ve learned from watching fashion re-touching and this issue I’m sharing one of these with you in our Grouped Masks article. There is also a look at the use of shutter speed and polarisation in the photographing of flowing water this issue and we end that article with another example of grouped masks. 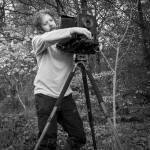 Finally we’re happy to include Wirral photographer Marianthi Lainas as our featured photographer.